SAINT LOUIS (June 19, 2013) -- Still, no one can find distance in the standings at the 2013 U.S. Junior Closed Championship. Wednesday marks the players’ rest day after Tuesday’s round 5 pushed the nine-game round-robin tournament past its halfway point. But despite a finish line that now looms, seven of ten players still sit within a point of each other, now with three tied atop the standings at 3.5/5 points. 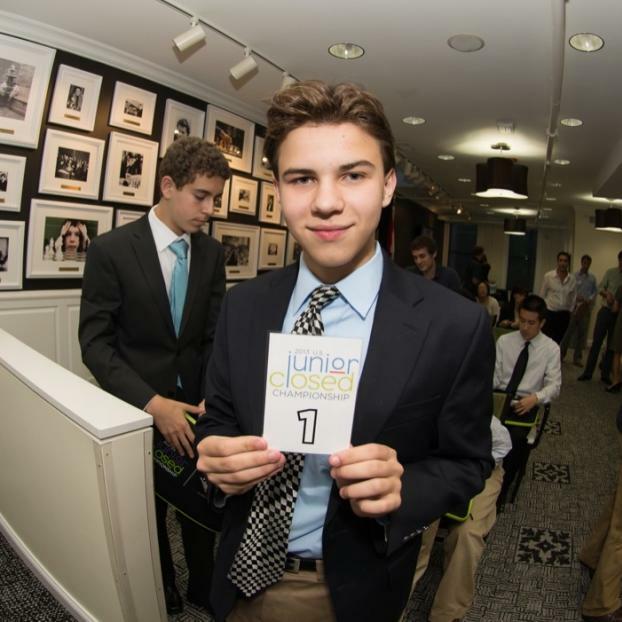 California IM Daniel Naroditsky, the field’s highest-rated player, was the sole leader entering Tuesday and has yet to lose a game this week at the Chess Club and Scholastic Center of Saint Louis. But his fifth-round draw against FM Sam Sevian slowed the pace, and wins from both FM Luke Harmon-Vellotti and FM Robert Perez brought them both up to speed. Harmon-Vellotti’s come-from-behind shocker over IM Victor Shen made it two wins and a draw against the field’s three top-seeded IMs; and Perez has shrugged off a slow start to the tournament to notch three straight victories, including Tuesday’s turnaround matchup versus FM Yian Liou. 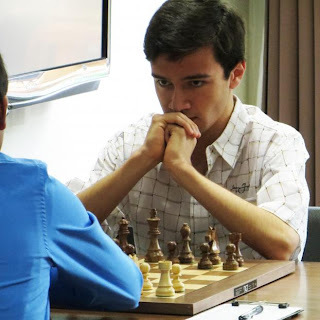 After an outstanding opening that found Shen up two pawns, including one passed on the sixth rank, he did everything he could to let his solid position slip away against Harmon-Vellotti – and he eventually got his wish. The game transposed to a Queen’s Indian, with Shen grabbing a solid foothold in the center and prepping his bishops for dominance. But Harmon-Vellotti’s 12. … Qf6 was very suspicious, begging for Shen’s 13. Bc3 response. The move showed Shen’s position clearly winning, with an advantage in development, a better dominance of space and several tactical opportunities brewing. He quickly converted it to a material advantage. But after wrecking the black queenside, Shen found trouble re-coordinating his pieces and was never able to find traction behind his three passed pawns, including two connected. Meanwhile, Harmon-Vellotti slowly pieced together a harmonious defense and let Shen sink into time pressure. Indeed, with under five minutes on his clock and eight more moves until time control, Shen offered up 32. Rxb5 with tactical eyes. But Harmon-Vellotti defied the play with 32. … Rbxb6, ultimately releasing nearly all of white’s pressure and gathering the d6 passer. Even still with winning chances, Shen struggled to find any continuance, and Harmon-Vellotti wreaked havoc on the white king with his remaining knight and rook. The move 57. … h5 kicked off a race to queen – one that Shen actually won, but left him positionally inferior. Perez performed his own climb out of a dark position thanks to an outstanding endgame and some fantastic work with his king. The game progressed through an unusual line of the Sicilian, but one Liou was up to the task of pressing. For more than 20 moves, he kept Perez on the defensive and looked primed to push solid queenside space into an advantage. But his 23. Ncd5 ignited a massive swap-out of material, ultimately leaving Perez with a bad bishop and Liou in control of the outpost – though limited in attacking ideas. That d6 pawn was more than “good” – it was the winner – as it was able to work its way over to the e-file and eventually down to its queening square. And it would not have been possible without the major play of Perez’s king, who helped open up some lanes against Liou’s kingside pawns and then escorted his passer to safety. After 37. Rdxe5 dxe5 38. Bxf8 won white a pivotal pawn advantage, 42. c5 allowed entry to the black monarch, who became a monster on the d-file. And after pushing the white king backward, Perez was able to swing around to the other side of the advancing e-pawn, finding safety from Liou’s remaining rook behind white’s own pawn. The secret of IM Kayden Troff’s fondness for the Grunfeld defense is out, as FM Atulya Shetty was the second player in a row to attack Troff with Anti-Grunfeld designs. But Troff showed little concern, looking solid through the opening including an excellent Nf6-Nd5-Nb4 transfer of his knight before castling his king. The series attacked the white queen and earned Troff the bishop pair, but it was not a reward held for long. Shetty was able to push back, eventually swapping out the light-squared bishop with 17. Nxe6, while taking control of the center and stacking pawns on Troff’s e-file in the process. From there, however, the game became a complicated mess, beginning with Shetty offering his e-pawn as a sacrifice – with apparent intentions of opening the file – though he struggled to find much compensation. Trying to bail himself out of the position, Shetty offered up his other center pawn, setting up a confusing conglomerate that even Troff – eventually with a two-pawn advantage – found trouble navigating. In the end, the frustration of opposite-colored bishops fizzled into the expected draw. Shetty was able to recollect a pawn with 43. Qxh7 and harass Troff’s king, which never did find time to castle. Sevian came at Naroditsky with the Ruy Lopez and met the Breyer, in a game that moved quickly through theory for more than 15 moves. Sevian’s 16. d5 intended to close the center, while Naroditsky’s response of Rc8 showed intentions of opening it, and both sides battled over their central intentions. Sevian grabbed the first material advantage with 22. Qxd6, but at the cost of being pushed into some awkward defense with Naroditsky controlling several key lanes. The position was headed swiftly toward an endgame featuring Sevian’s two knights versus Naroditsky’s two bishops, though white’s cavalry sat rather passive on the kingside wing. It prompted Naroditsky to push the envelope, acknowledging that he “didn’t want to let the knights get to good squares.” He traded off rooks with 29. … Rxc1, and then put Sevian on the spot with 32. … Qc3. Naroditsky offered a draw several minutes after the move, and Sevian accepted after ten minutes of thought. FM Jeffrey Xiong is starting to roll after two losses to open the tournament. He drew both his third- and fourth-round matches to Shen and Sevian, and then notched his first full-point win over WFM Sarah Chiang in round 5 as black. The game began in a Rubinstein Nimzo-Indian line, but Chiang looked to fall out of prep early, first moving 6. Ng3 and then following it with the unnecessary a3. The folly converted directly to the loss of her c4 pawn, which Xiong collected on move 13. Chiang all-but abandoned her queenside, instead loading her pieces around Xiong’s temporarily exposed king for an assault. But Xiong foresaw too strong of an advantage with his pawn majority, opting to give back his pawn advantage with 27. … e5, which traded the queens off the board and ultimately left Chiang far removed from Xiong’s connected passers on the queen wing. It was not an easy close for Xiong, as Chiang kept the black pieces occupied with her own passed pawn on the f-file and not able to help usher the a and b pawns in for promotion. Black eventually found its way through.